Metal veterans Soulfly returned to the UK with their extensive back-catalogue of extreme anthems. Tonight’s show was the first of an eight-date tour which sees the band headline some pretty intimate venues around the UK, plus a performance at Boomtown Fair in Winchester. After a disgustingly-sweaty journey from work on the Underground, I arrived at the O2 Academy in Islington shortly before doors and joined the sizeable queue of metal fans eager to get inside somewhere with air-conditioning and enjoy an evening of metal! First to take to the stage at around 7:30pm were occult / horror metal band The Heretic Order from London who I had seen once before at Mosh Against Cancer Coventry last year. 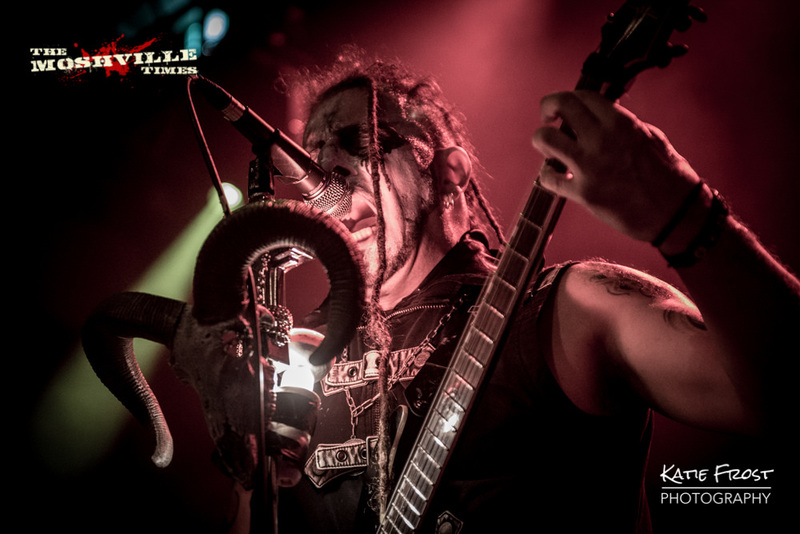 There seemed to have been a slight change in line-up since I last saw them, but they were still fronted by vocalist Lord Ragnar Wagner, who took up his position at the mic stand which was adorned with a ram skull and a red light-bulb. 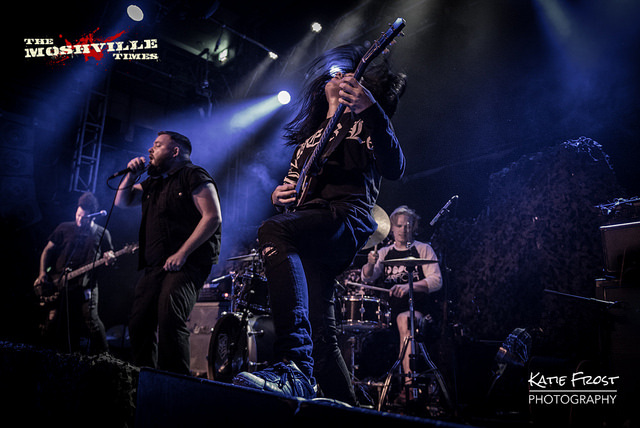 The band launched straight into “Hate Is Born” from their latest album Evil Rising [props to Dave B for correcting us – Ross], which was released at the end of June. Their set was unapologetically loud and they really got the crowd going. After playing a selection of tracks from Evil Rising including “Hate Is Born” and the title track, The Heretic Order ending their set with “Burn Witch Burn” from their 2015 debut album All Hail The Order. The Heretic Order will be playing the Jägermeister stage at Bloodstock Festival on Friday and you can read out our #ROADTOBOA2018 feature on them here. Next to hit the stage at shortly after 8:30pm were another London band; Death Remains, who we featured as Band of the Day back in May last year. This was my first time seeing the band and I instantly loved their crushingly heavy metalcore sound and groovy guitar riffs. Playing a selection of tracks from their latest album Destroy/Rebuild, their set was full-on and high-energy from the very start, and Barry O’Connor was an absolute powerhouse on vocals. The band were really engaging to watch and everyone in the now-packed room seemed to be really enjoying their set, as was I. Musically the band were tight as hell and I will definitely be going to see another of their live shows in the future. It had already been a fantastic evening of metal, but there was still one band left to play; metal legends Soulfly. As I joined my fellow photographers in the photo-pit we snuck a look at the set-list and we were definitely going to be in for a treat tonight! Camouflage nets covered the amps and other equipment on the stage, and there was a huge roar of excitement from the crowd as the house lights went down and the Arizona band walked out onto the stage. I saw Soulfly for the first time at Tons of Rock festival in Norway back in June and really loved their sound. I am embarrassed to admit that I hadn’t really listened to their music before then, but I absolutely loved their sound and now their tracks feature on heavy rotation on my [popular music-streaming service] playlist. The band opened their set with “Frontlines” from their 2005 album Dark Ages and went on to play a fantastic set of some of their best tracks from their extensive twenty-year back-catalogue, including “Fire” and “Bleed” from their 1998 debut self-titled album, and the scream-along classic “Blood Fire War Hate” from Conquer. Vocalist Max Cavalera (founder of Sepultura) was his usual charismatic self as he growled into the microphone and banged his dread-locked hair throughout their set, and the rest of the band were just as entertaining to watch; with guitarist Marc Rizzo frequently jumping high into the air, and bassist Mike Leon (formerly of Havok) and Zyon Cavalera (son of Max) giving it their all and keeping everything deliciously deep and heavy. Towards the end of their set the band played “Wasting Away” from Cavalera’s short-lived early-nineties side project Nailbomb which went down extremely well with the crowd. 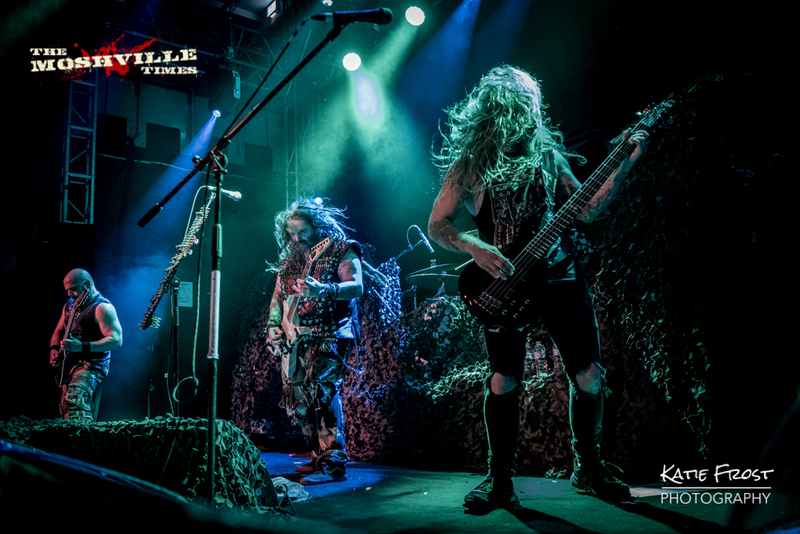 Soulfly’s set was riff-tastic and a load of fun – one of the best Monday nights I have had in a long time – and I would highly recommend that you get yourself along to one of the other dates on this tour, details below. The Heretic Order’s new album is called ‘Evil Rising’. ‘Forest of the Impaled’ is a track off the album.